NBC-Links.com: Jim Placke's Chemical, Biological, Radiological, and Nuclear (CBRN) Warfare Links Homepage. NBC-Links.com's purpose is to provide easy access to information related to chemical, biological, radiological, and nuclear (CBRN) warfare, defense, and domestic preparedness. NBC-Links.com is the internet's most comprehensive portal to CBRN-related information sources located on the web. NBC-Links.com is always striving to improve its contents. Please forward any recommendations, comments, your favorite CBRN links, and 404s (dead links) to the webmaster. This symbol indicates sites that are exceptional in content or quality. This site last updated on 8 January 2011. Sites added on 21 October 2007. 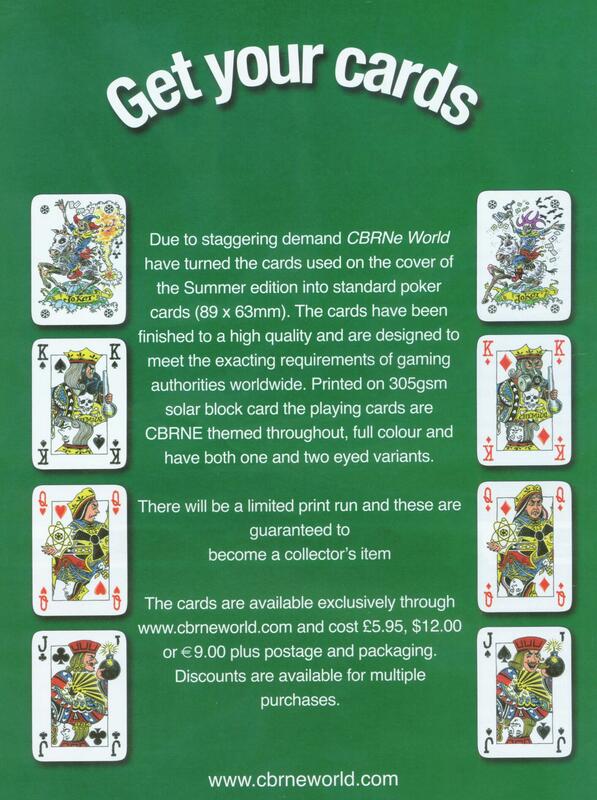 CBRNe-Themed Poker Cards CBRNe World Magazine is now taking orders for their CBRNe-themed poker cards! Click on the above link for a scan of the advertisement in their Autumn 2007 issue of CBRNe World. Order some today! PowerPoint Pogues' Homepage PowerPoint Humor at its best? Sites added on 3 July 2007. CBRNe World Magazine Great publication by Gwyn Winfield and David Levitt! Free for CBRNe professionals! The Summer 2007 issue has an interview with BG Thomas Spoehr, Chief of Chemical, US Army, about the next generation of CBRN warfighter. CBRNe World is published quarterly and serves the information needs of professionals around the world charged with planning for or responding to a chemical, biological, radiological, nuclear or explosives threat or incident. Spanning the divide of operational and scientific, it brings together opinion formers from the world of civil response, military leaders, academia, government, research labs and industry. Combining the already merging fields of CBRN and explosives together in one magazine, editorial content is a combination of qualitative and researched news, interviews, articles and regular columns.? CBRNe World is distributed FREE to CBRNe professionals. You can subscribe online by completing this form or you can download CBRNe World Magazine in the PDF Format here. Take a close look at the cards on the cover of the Summer 2007 issue. Hopefully, these will be available soon! Homeland Security?ortal (HLSP) The Homeland Security?ortal (HLSP) is an interactive?latform and?nformative arena where industry professionals can register, advertise and obtain information regarding new products, new technologies, industry news, case studies, investment opportunities and much more. HLSP is a?on-government initiative, aimed at serving the business community of the security and defense industries. International BioDefense Handbook 2007 An Inventory of National and International BioDefense Practices and Policies. It is a free publication from the "Crisis and Risk Network." It has been opined that it is not very analytical in its research but it has interesting facts on other nations. The Future Nuclear Landscape The NDU WMD Center released its notes on last year's annual symposium. The title of their compilation is "The Future Nuclear Landscape." It was very heavily into discussions on nuclear stockpiles, nuclear terrorism, etc. Sites added on 2 May 2007. JPEO-CBD Joint Program Manager Fact Sheets This page has information sheets (pdf) for Joint Program Managers for Biological Defense, Chemical Biological Medical Systems, NBC Contamination Avoidance, Decontamination, Collective Protection, Individual Protection, Information Systems, and Guardian. Article: The Office of the Special Assistant for Chemical Biological Defense and Chemical Demilitarization, OSA(CBD&CDP), has recently published two reports and submitted them to Congress. ?istribution of these documents is not restricted, and is encouraged. (1)?i> The 2007 Chemical Biological Defense Program (CBDP) Annual Report to Congress. (pdf) The first report is a detailed description of the plans and activities of the CBDP. ?The report is 335 pages. ?A 30 page extract is also provided. ?This annual report provides information and assessments regarding the overall readiness of the armed forces to fight in a CB warfare environment, along with efforts undertaken and ongoing plans to improve such readiness; and the requirements for the CBDP, including requirements for training, detection, protective equipment, decontamination equipment, medical prophylaxis, and treatment of casualties resulting from the use of CB weapons.? (2)? Transformational Medical Technology Initiative (TMTI) Report to Congress. (Word) The second report responds to Congressional tasking identified and provides background information on the TMTI program and provides goals, benchmarks, and metrics for the overall TMTI program. ?This report is 20 pages long. Army Chemical Review (pdf file) New edition (Jan-Jun 2007) of the Army Chemical Review. WMD Insights This website presents a monthly publication intended to provide U.S. Government decision-makers, action officers, and analysts with timely and noteworthy unclassified information on international attitudes towards weapons of mass destruction and efforts to curb their proliferation. This product seeks to combine the skills and capabilities of subject matter specialists with those of foreign language experts to gain insights into issues that are shaping the proliferation landscape. Our goal is to assist our readers in planning for today’s issues and those that may be just over the horizon. The WMD Insights project is sponsored by the Defense Threat Reduction Agency (DTRA). Joint Program Executive Office for Chemical and Biological Defense The Joint Program Executive Office for Chemical and Biological Defense (JPEO-CBD) is the principal advocate and single point of contact for all chemical, biological, nuclear and radiological detection, and vaccine and medical diagnostic acquisition efforts within the scope of the JPEO-CBD charter. Includes links to Joint Program Managers for Contamination Avoidance, Collective Protection, Individual Protection, Decontamination, Guardian, Medical Systems, Information Systems, and Biological Defense. Sites added on 24 March 2007. Article: The Unthinkable Can the United States be made safe from nuclear terrorism? Author: Steve Coll. 12 March 07. New Yorker Magazine. 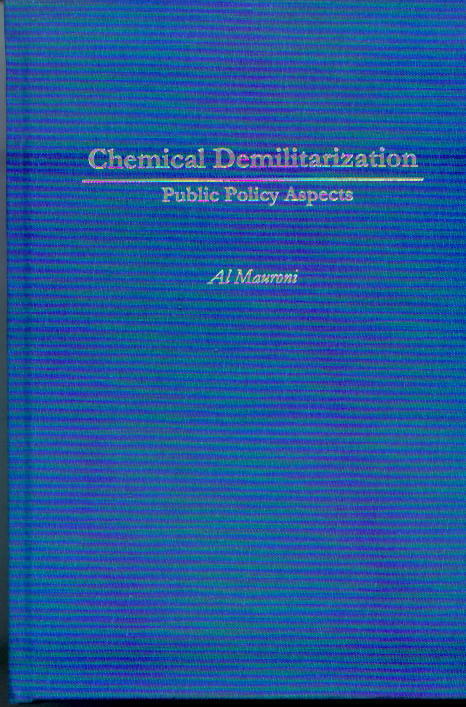 Incapacitating Biochemical Weapons: Science, Technology, and Policy for the 21st Century (pdf file) Briefer/author: Alan Pearson. THE NONPROLIFERATION REVIEW hosted a luncheon briefing on Identifying, Confronting, and Controlling Proliferation Threats at the Washington, D.C., office of the Monterey Institute Center for Nonproliferation Studies on January 17, 2006.? Chemical Biological Radiological Nuclear Information Resource Center (CBRN-IRC), formerly the CBRN Equipment Hotline. The CBRN-IRC provides customers with a one-stop location for the information they need. The CBRN-IRC strives to provide timely information to members of the military in the field as well as those in garrison. ?he primary purpose of the IRC is to be successful at one thing and one thing only?ustomer satisfaction. Requests for information come into the hotline via a telephone hotline or E-mail. ?hese requests receive a response within 24 hours whenever possible. Instead of customers taking it upon themselves to expend countless hours calling technical and logistical support personnel, a single call to the hotline is all that's needed. ?he CBRN-IRC personnel will conduct any and all necessary research to answer customers' inquiries.? By contacting the CBRN-IRC (1-800-831-4408 or CBRN@conus.army.mil), customers can rest assured they will receive service that is prompt, professional, useful, and courteous. ?nce again, the primary purpose of the hotline is to be successful at one thing and one thing only?ustomer satisfaction! Although it is not a toll-free number, you may also FAX the CBRN Equipment Hotline at (309) 782-1919 or DSN 793-1919. For further assistance, please contact Ms. Sandra Earhart at (309) 782-1681 (DSN 793-1681) or via e-mail at CBRN@conus.army.mil. Radiation Incidents: "Manual for First Responders to a Radiological Emergency" (pdf file) International Atomic Energy Agency. October 2006. Terrorism and Other Public Health Emergencies: A Field Guide for Media US Department of Health and Human Services. Terrorism and Other Public Health Emergencies: A Reference Guide for the Media. US Department of Health and Human Services. Army Toolbag This site is a one-stop, get what you need site for military leaders. It is constantly updated; subscribe to get the weekly newsletter. Cyanide Poisoning Treatment Coalition The Cyanide Poisoning Treatment Coalition is a 501(c)(3) non-profit made up of organizations whose members have direct involvement with the identification and treatment of cyanide exposure. Trinity Atomic Test Site Great site! Nuclear Weapons: History, technology, and consequences in historic documents, photos, and videos. Sites added on 22 March 2007. Book: Chemical Warfare Secrets Almost Forgotten Author: Dr. James S. Ketchum. Chemical warfare watchers, from scientists to policy advocates, often wonder what went on at the Army Chemical Center during the 1960s. It was a decade in which thousands of Army enlisted men served as volunteers for the secret testing of chemical agents. The actual historical record, however, has until now remained disturbingly incomplete.? This book goes a long way toward revealing the contents of once classified documents that still reside in restricted archives. The author spent most of a decade testing over a dozen potential incapacitating agents including LSD, BZ and marijuana derivatives. ?His 380-page narrative, loaded with both old and recent photographs, derives from technical reports, memoranda, films, notes and memories. ?The book is written primarily for the general reader, but supplemented by a voluminous appendix of graphs and tables for the technically inclined, Dr. Ketchum’s book combines a subjective diary with an objective report of the external events that shaped and eventually terminated the program. ?Informal and autobiographical in style, it includes numerous amusing anecdotes and personality portraits that make it simultaneously intriguing and informative.? CBRNe World CBRNe World is published quarterly by Falcon Communications Ltd and serves the information needs of professionals around the world charged with planning for or responding to a chemical, biological, radiological, nuclear or explosives threat or incident. Spanning the divide of operational and scientific, it brings together opinion formers from the world of civil response, military leaders, academia, government, research labs and industry. Combining the already merging fields of CBRN and explosives together in one magazine, editorial content is a combination of qualitative and researched news, interviews, articles and regular columns. Book: The Effects of Nuclear Weapons, 3rd Edition. Authors: Samuel Glasstone and Philip J. Dolan. The classic on nuclear effects is finally on-line! HYDESim HYDESim maps overpressure radii generated by a ground-level detonation; these radii are an indicator of structural damage to buildings. No other effects, such as thermal damage or fallout levels, are included in this tool. Note that the displayed rings are "idealized"; that is, no account is taken of terrain, urban density, ground type, weather conditions, and so on. The data used in HYDESim are based on information found in "The Effects of Nuclear Weapons", 3rd Edition, by Samuel Glasstone and Philip J. Dolan. Chem-Bio Defense Quarterly (pdf file) Jan-Mar 07. Documents on the U.S. Atomic Energy Detection System [AEDS] In August 1948, the U.S. Air Force created the Office of Atomic Energy-1 [AFOAT-1], giving it responsibility for managing the Atomic Energy Detection System [AEDS] discovering foreign atomic tests and other nuclear-weapons related activities. AFOAT/1 [later renamed the Air Force Technical Applications Center, or AFTAC] soon had an early triumph--the discovery of the first Soviet atomic test in 1949. For many years, AFOAT-1/AFTAC operated under the veil of secrecy; in 1949 no one without a high security clearance and only those with a clear "need to know" were aware that it was AFOAT-1 that had detected the Soviet test. It was not until 1975 that the Air Force even admitted that AFTAC had responsibility for operating the AEDS. New Radiation Symbol A new ionizing radiation warning symbol (with radiating waves, a skull and crossbones and a running person) is being introduced to supplement the traditional international symbol for radiation, the three cornered trefoil. The new symbol is being launched today by the IAEA and the International Organization for Standardization (ISO) to help reduce needless deaths and serious injuries from accidental exposure to large radioactive sources. Homeland Security Presidential Directive/HSPD-18 HSPD-18 "Medical Countermeasures against Weapons of Mass?estruction" defines ?in very clear and short sentences ?the categories of nuclear weapons, chemical and biological warfare agents, and radiological and chemical hazard agents. Chemical and Biological Defense. Management Actions Are Needed to Close the Gap between Army Chemical Unit Preparedness and Stated National Priorities (pdf file) GAO Report 07-143 (January 2007). This report is on the current disconnect between DOD rhetoric on combating WMD and the Army Chemical Corps?current low readiness levels. Chemical and Biological Defense. Updated Intelligence, Clear Guidance, and Consistent Priorities Needed to Guide Investments in Collective Protection (pdf file) GAO Report 07-113 (January 2007). This report is on DOD’s failure to adequately guide investments on collective protection and includes some good comments on installation protection. Slashdot News for nerds, stuff that matters. Journal of Medical Chemical, Biological and Radiological Defense The Journal's mission is to provide capabilities to reduce, eliminate, counter and mitigate the threat presented by weapons of mass destruction (WMD). The JMedCBR's goal is to be the "go-to" website for reliable and professional information on research related to the development of medical countermeasures targeted against chemical, biological and radiological threats. The Journal will provide this service through peer-reviewed articles and archived information. JMedCBR is committed to providing an open access journal for presentation of pertinent scientific articles and timely policy issues related to CB research. Sites added on 12 November 2006. New Board: ?edical WMD Items of Interest I would like to introduce a new weekly column by Dr. Glen I. Reeves, MD, MPH. ?he topic of the columns will be an informal weekly report on items pertaining to the medical implications of WMD-related news going on worldwide. ? Chemical Warfare (Wikipedia) Nice overview of chemical warfare from Wikipedia, the free encyclopedia. Gas, Mud, and Blood at Ypres: The Painful Lessons of Chemical Warfare Article by Major Thomas S. Bundt, U.S. Army, Ph.D.
Digital Archive: Gas Warfare in World War I Lists and provides pdf copies of the 20 reports issued following WWI, written by R. Cochran on Gas Warfare. Cochrane, Rexmond Canning. Gas Warfare in World War I. U.S. Army Chemical Corps Historical Office. Army Chemical Center, Maryland: U.S. Army Chemical Corps Historical Office. 1959-1960. Note about content: Documents were scanned and provided in .pdf files. Many of the files still need some cleaning-up but we are providing them now since users have requested e-access. A History of Chemical & Biological Warfare by Greg Goebel. Joint Publication 3-41: Chemical, Biological, Radiological, Nuclear, and High-Yield Explosives Consequence Management? pdf file, 2 October 2006, size = 2.2M. US Army Chemical Corps Documents Reports from the biological, chemical, and radiological warfare program of the US. All documents supplied by Susan L. Maret, PhD. Sites added on 29 October 2006. By contacting the CBRN-IRC (1-800-831-4408 or CEH@ria.army.mil), customers can rest assured they will receive service that is prompt, professional, useful, and courteous. ?nce again, the primary purpose of the hotline is to be successful at one thing and one thing only?ustomer satisfaction! Although it is not a toll-free number, you may also FAX the CBRN Equipment Hotline at (309) 782-1919 or DSN 793-1919. For further assistance, please contact Ms. Sandra Earhart at (309) 782-1681 (DSN 793-1681) or via e-mail at CEH@ria.army.mil. Sites added on 22 October 2006. 2006 Disaster Preparation Resources CD. Employers and employees involved in cleanup and recovery efforts following natural disasters will benefit from a new "tool" developed by OSHA and the Gulf Coast Chapter of the American Society of Safety Engineers (ASSE). The 2006 Disaster Preparation Resources CD features a compilation of resources from OSHA, ASSE, the Centers for Disease Control and Prevention, and the Federal Emergency Management Agency on ensuring safe and healthful response and recovery operations. The CD will help employers review, develop and update their emergency preparedness plans. E-mail ASSE's Sarajenie Smith at ssmith@asse.org for a copy, or call (847) 699-2929. JP 3-41, Chemical, Biological, Radiological, Nuclear, and High-Yield Explosives Consequence Management?/a> (pdf file) Recently released (2 October 2006) Size = 2.2 MBs. Sites added on 24 September 2006. Chemical Suppliers Directory?/a> Chemical Suppliers Directory is the list of companies providing compounds and compound libraries, chemical building blocks, combinatorial chemistry libraries, custom synthesis, fine chemicals and services that support drug discovery in the pharmaceutical industry.?? Radiation Issues: Medical Management of Internally Radiocontaminated Patients. (pdf file) Los Angeles County Department of Health Services EMS and MMRS. CB Masks and Alarms Technical Manuals?/a> Integrated Publishing's site for technical manuals. TM's can be viewed on-line for free (html pages). You can also download TMs in pdf format for a nominal fee. Edgewood Chemical Biological Center ECBC is the nation's principal research and development center for non-medical chemical and biological defense. ECBC develops technology in the areas of detection, protection, and decontamination and provides support over the entire lifecycle - from basic research through technology development, engineering design, equipment evaluation, product support, sustainment, field operations and disposal. Combating Nuclear Terrorism: Federal Efforts to Respond to Nuclear and Radiological Threats and to Protect Emergency Response Capabilities Could Be Strengthened. ?/a> GAO-06-1015, September 21. Sites added on 10 June 2006. NBC International Magazine?/a> The world's leading magazine on chemical, biological, radiological and nuclear (CBRN) defence. Whether counter-terrorist and specialist emergency service personnel or senior military and governmental figures worldwide, NBC International provides NBC professionals with the information they need. YouTube.com?/a> Search this site for "Brainiac" videos. Brainiac is the show that squares up to science and says, 'come and have a go if you think you're hard enough.' It's a unique beast--part science, part stunts--all mental. Each and every week they'll bring you all that's weird, wonderful and wild in the world of science, served up with a healthy dollop of explosions, pyrotechnics and anything else they can get our hands on--legally or illegally! One of my favorites is Brainiac: Alkali Metals. Sites added on 4 June 2006. OSIRIS Property Explorer?/a> The OSIRIS Property Explorer?s an integral part of Actelion's in-house substance registration system. It lets you draw chemical structures and calculates on-the-fly various drug-relevant properties whenever a structure is valid. Prediction results are valued and color coded. Properties with high risks of undesired effects like mutagenicity or a poor intestinal absorption are shown in red whereas a green color indicates drug-conform behaviour. The property explorer allows the prediction of molecular properties of new compounds bases on a set of known molecules (2000). The quality of the prediction and some parameters are explained in an online-tutorial. CBRNE Online The unofficial site for 3E9X1 (Air Force). A Guide to Transportation's Role in Public Health Disasters Transportation Research Board (TRB) of the National Academies. TRB's National Cooperative Highway Research Program (NCHRP) Report 525: Surface Transportation Security, Volume 10: A Guide to Transportation's Role in Public Health Disasters examines development of transportation response options to an extreme event involving chemical, biological, or radiological agents. The report contains technical information on chemical, biological, and radiological threats, including vulnerabilities of the transportation system to these agents and consequence-minimization actions that may be taken within the transportation system in response to events that involve these agents. The report also includes a spreadsheet tool, called the Tracking Emergency Response Effects on Transportation (TERET) that is designed to assist transportation managers with recognition of mass-care transportation needs and identification and mitigation of potential transportation-related criticalities in essential services during extreme events. The report includes a user's manual for TERET, as well as a PowerPoint slide introduction to chemical, biological, and radiological threat agents designed as an executive-level communications tool based on summary information from the report. Uniform Accessories Unlimited The best site on the web for all of your military uniform needs?Army, Air Force, Navy, Marines, Color Guard. It’s the best site I have found for shoulder patches and unit crests. Their customer service support is second to none. Sites added on 20 March 2006. National Homeland Security Knowledgebase The National Homeland Security Knowledgebase includes comprehensive Homeland Security information resources, Homeland Security News, Homeland Security Newsletter, Homeland Security Research, Homeland Security Technology Sectors, Homeland Security Marketplace, Directories and a collection of links on Homeland Security related topics as well as links and info relating to global security issues. Surveillance for World Trade Center Disaster Health Effects Among Survivors of Collapsed and Damaged Buildings Symposium (pdf file) From the CDC MMWR Series. Management of Dead Bodies After Disasters Symposium A Field Manual for First Responders. Pan American Health Organization, WHO, ICRC. 2006. CAPS Decontamination Platform Survival Inc. has developed a standardized CBRNE decontamination platform called the Contaminant Air Processing System (CAPS). Survival Incorporated has internationally established its reputation and expertise in the chemical, biological, radiological, nuclear and high-yield explosives (CBRNE) defense and decontamination arena.? Canadian C4 Gas Mask Website New site that includes pictures of black/green C4's and also some information about the AC4. Alluviam Alluviam: HazMat/CBRNE/IED Response Software and Systems. Alluviam's solutions: Highly mobile, best of breed solutions for emergency/terrorism response, homeland defense, forensics, law enforcement, emergency medical services and industrial emergency response. HazMasterG3, Alluviam's flagship HazMat/CBRNE/IED decision support system, is consistently ranked way out in front of other legacy systems. Sites added on 26 December 2005. Le Masque ?Gaz Recently updated and expanded!! Le Masque ?Gaz is probably the world's most comprehensive on-line gas mask database. DGI's CoBRA Decision-Support Toolset for Crisis Response CoBRA emergency response products?esigned by first responders for first responders?rovide critical decision-support tools and resources required to effectively prepare for and respond to all hazard incidents. CoBRA is a proven crisis response technology used in planning, training, exercise and operational response. It has been deployed to more than 2,000 first responder and emergency management agencies and was used by federal, state and local agencies in high profile events such as the 2002 Winter Olympics, Topoff II and III, the Republican and Democratic 2004 Conventions and the 2005 Presidential Inauguration. What's Special About This Number? Distinctive facts about numbers. Warning: Geek factor of 9.75. HyperPhysics HyperPhysics is an exploration environment for concepts in physics which employs concept maps and other linking strategies to facilitate smooth navigation. Neat site on the fundamentals of physics. Polish Chemical Defense Equipment Polish chemical defense equipment from the Ministry of National Defense, Republic of Poland. Report: Review of the Army's Technical Guides on Assessing and Managing Chemical Hazards to Deployed Personnel National Academy of Sciences report. You can read it online or download the pdf file for free. Google It! A great site for those who are to lazy to do basic web-based research! Roflmao! 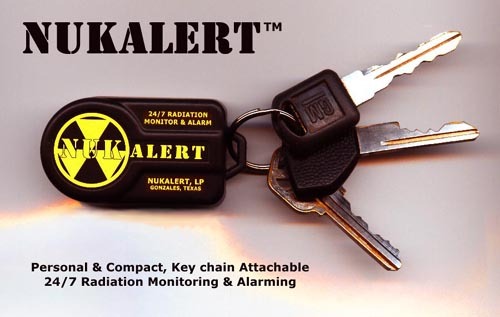 Radiation Issues CDC's Roles in the Event of a Nuclear or Radiological Terrorist Event. Senses Challenge Not NBC related but pretty entertaining. Google Earth Awesome! This is 10x better than Google Maps! The resolution is incredible. US Army Chemical Corps Museum The site has historical photos and numerous downloadable pdf files on the history of the Chemical Corps. The Technical Services in OVERLORD The Center of Military History provides chapters on the technical services' (to include the chemical warfare service) participation and planning in the Normandy Invasion: OVERLORD. The chapters were extracted from the Technical Services volumes of the U.S. Army in World War II series. National Homeland Security Knowledgebase The National Homeland Security Knowledgebase is a comprehensive Homeland Security information resource for Homeland Security news, Homeland Security marketplace, directories and a collection of links and info on Homeland Security related topics. Battelle CBRN/WMD Defense Battelle recently created a new National Security site that includes an overview of their?BC capabilities along with several case studies and innovations in this area. ? Patient Decontamination Recommendations for Hospitals (pdf file) Emergency Medical Services Authority (California). July 2005. NBCD Homepage NBCD is a data-driven website incorporating research information, indexes and resources building on over 25 years of collecting and historical research in the field of Nuclear, Biological and Chemical Defence. EqWorld: The World of Mathematical Equations The EqWorld website presents extensive information on solutions to various classes of ordinary differential, partial differential, integral, functional, and other mathematical equations. It also outlines some methods for solving equations, includes interesting articles, gives links to mathematical websites, lists useful handbooks and monographs, and refers to scientific publishers, journals, etc. This site will be kept up to date to include new equations with solutions and other useful information. All resources presented on this site are free to its users. Homeland Security: DHS' Efforts to Enhance First Responders' All-Hazards Capabilities Continue to Evolve (pdf file) GAO Report, GAO-05-652, July 2005. HNSA-Underwater Sound Project The Historic Naval Ships Association (HNSA) provides some real (nothing from Hollywood) underwater sounds?everything from submarines to whales. Sites added on 30 May 2005. DOD CBDP Annual Report Volumes 1 and 2 of the latest DOD CBDP Annual Report are out. They are full of interesting tidbits about your favorite CBDP acquisition programs and other CBDP stuff. ? Jane's Nuclear, Biological and Chemical Defence Jane's Nuclear, Biological and Chemical Defence offers both expert analysis of the NBC threat and comprehensive details on the manufacturers and their products involved in meeting that threat. It is ideal for providing guidance for threat assessment and for the procurement of defensive equipment identified as a requirement. Equipment entries include detailed descriptions, including specifications, together with availability status, manufacturer details and pictures or diagrams to enable comparison and appraisal. Boris' Gas Masks Page An excellent site on a wide variety gas masks. Click on a country flag and then click on a mask in the left pane. Mask details and history will appear in the main frame. Interview with Alexander Kouzminov (Biological Espionage) Alexander Kouzminov was an intelligence operative in the 1980s and early 1990s for the KGB and its successor, the Russian Foreign Intelligence Service. He is the author of "Biological Espionage," an inside account of his work within the top secret "Directorate S" where he helped implement Russia’s plans for biological espionage and biological warfare. The California Literary Review recently spoke with Dr. Kouzminov about his past work and the dangers he foresees in an age of genetic engineering. Chem-Bio Defense Quarterly Magazine Publication of the Joint Program Executive Office, Chemical and Biological Defense (JPEO-CBD). Technical Support Working Group (TSWG) The Technical Support Working Group (TSWG) is the U.S. national forum that identifies, prioritizes, and coordinates interagency and international research and development (R&D) requirements for combating terrorism. The TSWG rapidly develops technologies and equipment to meet the high priority needs of the combating terrorism community, and addresses joint international operational requirements through cooperative R&D with major allies. Ethanol Interesting site on ethanol production and distillation. The site offers several links to additional information. Planning Scenarios (Executive Summaries) created for Use in National, Federal, State, and Local Homeland Security Preparedness Activities The Homeland Security Council (HSC) ?in partnership with the Department of Homeland Security (DHS), the federal interagency, and state and local homeland security agencies ?has developed fifteen all-hazards planning scenarios for use in national, federal, state, and local homeland security preparedness activities. These scenarios are designed to be the foundational structure for the development of national preparedness standards from which homeland security capabilities can be measured. While these scenarios reflect a rigorous analytical effort by federal, state, and local homeland security experts, it is recognized that refinement and revision over time may be necessary to ensure the scenarios remain accurate, represent the evolving all-hazards threat picture, and embody the capabilities necessary to respond to domestic incidents. This document includes executive summaries for the fifteen scenarios, and a separate document contains the complete scenario text. NBCD - Nuclear, Biological and Chemical Defence NBCD is a data-driven website incorporating research information, indexes and resources building on over 20 years of collecting and historical research in the field of Nuclear, Biological and Chemical Defence. 14th Chemical Maintenance Company (1942-1945) This website is dedicated to the men of the 14th CMC. ?They served with merit in the European Theatre of Operations (ETO) supporting the 1st U.S. Army in its successful fight to help defeat the armed forces of Nazi Germany. ?Veterans of the 14th, their family members, and others are asked to please contribute information and photos about the unit for use on this website.? Homeland Security: Much Is Being Done to Protect Agriculture from a Terrorist Attack, but Important Challenges Remain. (pdf file) GAO-05-214, March 2005. Emergency and Terrorism Preparedness for Environmental Health Practitioners The Environmental Health Services Branch of CDC's National Center for Environmental Health invites you to visit its new Emergency and Terrorism Preparedness for Environmental Health Practitioners Web site. How to Tell the Gases Written by Fairfax Downey, Major, Field Artillery. Printed inside the cover of Gas Warfare. Smoke, Flame, and Gas in Modern Warfare. by BG Alden H. Waitt. The Infantry Journal, Fighting Forces Series. Second Edition. April 1944. ? BORDERS The BORDERS acronym stands for Biochemical Organic Radiological Disaster Educational Response System, which is being developed by the University of North Dakota School of Medicine and Health Sciences through a federal grant from the Health Resources and Services Administration. BORDERS is an innovative, comprehensive education and training program designed to build a more coordinated and efficient public health emergency detection and preparedness system by training health care professionals and first responders across all disciplines to be "Alert and Ready" in the event of a terrorist attack or other man-made or naturally-occurring disaster. Chemical Unit Heraldry Institute of Heraldry. Chemical Biological Radiological Nuclear (CBRN) Equipment Hotline: The CBRN Equipment Hotline is a toll-free Number for use by any warfighter (Army, Navy, Air Force, Marine, National Guard, or Reserve) who has any question regarding CBRN defense equipment that cannot be resolved through normal channels. In addition to uniformed personnel, government civilians and defense contractors can also call the Hotline for questions regarding CBRN defense equipment. Case Definitions for Chemical Poisoning In this report, CDC presents case definitions to facilitate uniform reporting among local, state, and federal public health agencies of illness resulting from a chemical release. Field Manual 3-11.9 (pdf file) FM 3-11.9: Potential Military Chemical/Biological Agents and Compounds. January 2005.? La Guerre des Gaz (French site) La Guerre des Gaz provides the historical and technical history of the Chemical Warfare from WWI up to the beginning of the WWII of the French and German Army. Petr Hemerle's Gas Mask Site Petr Hemerle's site is an excellent resource for mask identification. Armchair Generalist: A Progressive View on Military Affairs This site belongs to a blogger who discusses general military topics and specific CBRN defense issues. The blogger describes himself as "left of center, a moderate or progressive voice, and a proud member of the reality-based community" and hopes his blogs will broaden the discussion on the aforementioned topics. The blogger is a defense policy analyst in the DC area and a former Army officer who specializes in DOD chemical and biological defense issues. Bioterrorism Preparedness Program Rhode Island, like other states, is preparing to respond to a potential bioterrorism event. As part of this preparation, they are providing all Rhode Island residents with some basic information on bioterrorism. Google Scholar Google's new (beta) search engine for refereed literature. Unfortunately, American Chemical Society (ACS) journal articles will not be available due to their monopoly on article copyrights as a publication requirement. Aside: The ACS has just filed suit against Google "Scholar" for infringement on their copyrighted name "SciFinder Scholar." Internet Archive: Moving Image Archives A great site for old videos and movies. This collection is free and open for use by everyone. Their goal in digitizing these movies and putting them online is to provide easy access to a rich and fascinating core collection of archival films. Aluminum Foil Deflector Beanie (AFDB) Practical mind control protection for paranoids by Lyle Zapato. Lots of new information, including expanded construction and usage tips, vital psychotronic deflection theory, an overview of AFDB alternatives, a guide to potential mind control enemies, and the never-before-elucidated history of the AFDB. Get yours before it's banned by the forces of mind control! LOGSA Download: You can download an electronic copy of a TM by going to the LOGSA website, obtaining a password and login, and doing a title search or looking for all TMs that start with 3 (which represents chemical equipment). AKO Download:?You can go to the following AKO site and use your AKO account Login and Password. Other 3 series TMs are also located at this AKO site. Public Health Emergency Response Guide for State, Local, and Tribal Public Health Directors The Public Health Emergency Response Guide for State, Local, and Tribal Public Health Directors is an all-hazards reference tool for health professionals who are responsible for initiating the public health response during the first 24 hours (i.e., the acute phase) of an emergency or disaster. It provides useful information on the activation and integration of a jurisdiction’s public health system into the existing overall emergency response structure during the acute phase of an incident. It also contains guidance that may be unique to specific types of incidents, such as floods, earthquakes, and acts of terrorism. CDC. ?ctober 2004. USF's Holistic Numerical Methods Institute Excellent resource for numerical methods. The institute is committed to bringing numerical methods to undergraduates. The site contains numerous examples across several engineering disciplines in solving a variety of problems (nonlinear, simultaneous linear, regression, interpolation, integration, and ordinary differential equations) using numerical methods (Maple, Mathcad, Mathematica, Matlab). The Elements Warning: Geek factor of 9.3. An animation based on Tom Lehrer's famous creation entitled "The Elements." It's a tune comprised of little more than the elements of the periodic table (circa 1955) sung to a vaguely recognizable tune. Chemical Drawing Program (MDL ISIS/Draw) You can download a very powerful chemical drawing program freely as long as it is for academic purposes. ?You do have to register on the website, but that is easy. Look for MDL ISIS/Draw as a download. Todar's Online Textbook of Bacteriology Excellent resource by Kenneth Todar, Department of Bacteriology, University of Wisconsin. This textbook has evolved from online and live-in-person lectures presented in my bacteriology courses at the University of Wisconsin-Madison. Its contents are suitable for reading or presentation in courses or course modules concerning general microbiology and medical bacteriology at the college and advanced high school levels of education. As an electronic text, new material is constantly being added, and current material is constantly being revised and updated. Worldwide Chemical Conference (WWCC) and Exhibition XXI?/a> Presentations from the WWCC. October 13-15, 2004. The Chemical Connection?/a> The site aims to make the connection between chemistry and everyday life, through demonstrations, exhibits, "hands-on" workshops, and these interactive WebPages. It explores chemistry in its simplest forms through to the current research being undertaken in the School of Chemistry at The University of Edinburgh. They have created four chemical connection themes to explore some of the ways that chemistry affects us all. How to Brew?/a> How to Brew - the definitive book on making quality beers at home. Whether you want simple, sure-fire instructions for making your first beer, or you're a seasoned home brewer working with all-grain, this book has something for you. How to Brew covers the full range of brewing possibilities - accurately, clearly, and simply. How to Brew (1st Edition) is on-line and free. (Brewing is a great way to learn fermentation fundamentals!!) Life begins at 60 - 1.060, that is. PDA Version of the 2004 Emergency Response Guide Region I ATSDR has created a PDA Version of the 2004 Emergency Response Guide. PDA version and PDF versions are available through the RI Department of Health web site. Problem Solved Two problems, one solution? Science Laboratory Experiments Stephen Fuller's page on laboratory experiments for young people to do at home, as well as a reference for science teachers. Most of the labs are intended for grades 7-12, but many can easily be done by younger scientists. There are 141 labs and projects, so look in all the subject areas. 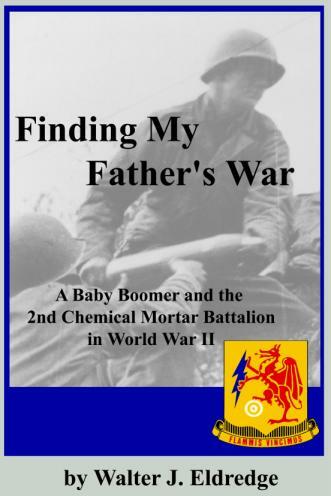 Book: Finding My Father's War: A Baby Boomer and the 2d Chemical Mortar Battalion in World War II. By Walter J. Eldredge. Equipped to be America's defense against gas warfare, the chemical mortar battalions brought their guns into action with high explosive and white phosphorous. In 511 days of combat, the 2nd Chemical Mortar Battalion cleared the way for eighteen divisions in seven campaigns and three invasions. Here for the first time is the story of this combat-tested unit, told in the pictures and memories of the veterans themselves with the son of a mortar company commander as their voice. Look for a book on the 2d Chemical Mortar Battalion's Korean War history in 2006. Countertop Chemistry?/a> There is a lot of interesting science to investigate in this world. Not all of the science is done by scientists wearing white coats and working in laboratories. Countertop Chemistry provides simple demonstrations to help students grasp fundamental chemical concepts without requiring a laboratory or expensive laboratory equipment or dangerous chemicals. Chemistry: The Science in Context?/a> Chemistry: The Science in Context was developed by a team of highly-qualified chemistry educators, This student resource offers a thorough review of concepts, engaging animated tutorials (over 100 of them!) that help students visualize dynamic processes, and interactive practice exercises that help develop quantitative skills. 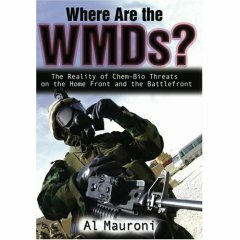 ChemDawg.com?/a> A new site for the chemical soldier that offers a variety on NBC-related materials to include downloads, training/class materials, videos, MWOs, etc. Chemdawgs! Powells.com?/a> Another source to locate hard-to-find books. Grants.gov?/a> Grants.gov allows organizations to electronically find and apply for competitive grant opportunities from all Federal grant-making agencies. Grants.gov is THE single access point for over 900 grant programs offered by the 26 Federal grant-making agencies. What You Should Do to Prepare for and Respond to Chemical, Radiological, Nuclear, and Biological Terrorist Attacks. ?/a> RAND Corporation, 2004. The RAND Corporation announced it is making available two pocket guides designed to arm?ndividuals with the knowledge to identify and survive various types of unconventional terrorist attacks. The guides are based on strategies RAND first outlined in a report last year and include a single-sheet, foldable reference?ard and a downloadable personal digital assistant (PDA) program. Center for the Study of Weapons of Mass Destruction Effective September 15, 2004, the Center for Counterproliferation Research at the National Defense University (NDU) has changed its name to the Center for the Study of Weapons of Mass Destruction (WMD Center). The Center is one of the nation's premier institutions of thought, research, instruction and analysis as applied to countering the proliferation of weapons of mass destruction. Building Protection Guidance and Resources (WMD events) Department of Energy,?awrence Berkeley National Laboratory. Building Vulnerability Assessment & Mitigation Program (BVAMP) Department of Energy,?awrence Berkeley National Laboratory. Grants.gov Grants.gov allows organizations to electronically find and apply for competitive grant opportunities from all Federal grant-making agencies. Grants.gov is THE single access point for over 900 grant programs offered by the 26 Federal grant-making agencies. Planner's and Staff Officer/NCO Homepage! Check out the 'New Quotes' section?I recently added ~80 quotes from EUCOM/CENTCOM staff officers?Great stuff! ASA Newsletter Applied Science and Analysis (ASA), an international organization, was established in 1983 to specialize in nuclear, biological and chemical (NBC) defense and protection issues worldwide. ASA publishes the ASA Newsletter, the international journal in the NBC Defense field read in more than 121 countries.? Biohazard News Biohazard News is a civilian initiative addressing the threat of biological terrorism. The web site will provide a free source of reliable, timely information. In addition, you may subscribe to a free newsletter-to stay updated on the bioterrorism threat and get information about changes and additions to the web site. EarlyBird Online. A daily (duty days) concise compilation of the most current published news articles and commentary concerning the most significant defense and defense-related national security issues. Available by 0600 hrs. ChemBio Weapons and WMD Terrorism News Sign up!! CB Weapons and WMD News is an awesome (& free) source of timely and informative information. The "News" consists of links to and key excerpts from articles and other online resources gathered by the CNS Washington Office staff and delivered three times a week. CNS ChemBio-Terrorism News is prepared by the Washington, DC office of the Center for Nonproliferation Studies of the Monterey Institute of International Studies in order to bring timely and focused information to researchers and policymakers interested in the fields of chemical and biological weapons nonproliferation and WMD terrorism. The e-mail is distributed on Mondays, Wednesdays, and Fridays. If you would like to subscribe to this free service, please email chembio-terror@miis.edu or Chem-Bio with the subject heading "subscribe" and your email address in the message body. WMDNews.org WMDNews.org presents news from public sources about worldwide developments in areas associated with weapons of mass destruction. The site uses a perl-based news posting software that allows continuous updating throughout the day. They poll a large number of newspaper and magazine web sites to collect information. Items are summarized by their staff with emphasis on new information. Links to original articles are given where possible. Copyright (c) 2001-2011 Placke & Associates. For more information contact the webmaster. -Velcro backing on ACU patches. Click here for larger pictures and ordering information. Will consider chemical unit coins, distinctive insignia, or patches in trade. Coupled with the replica watches uk exciting timing function, gives a deep impression. Recently, we visited the IWC replica watches online, we saw a series of Portuguese bluetooth dish timepiece models, this watch was introduced in 2017, Yingying blue, deep and elegant, in the replica watches light source of the effect of a gradient, very Pretty. Coupled with mature, stylish black alligator strap, people shines rolex replica.